I have started a Blog, where I will write about my DIY projects and maybe also about JavE. Released release candidate RC2 of JavE 6.0. Added a new icon from Scott Blevins to the logos page. The first HTML version of the FIGfont Version 2 FIGfont and FIGdriver Standard is now online. 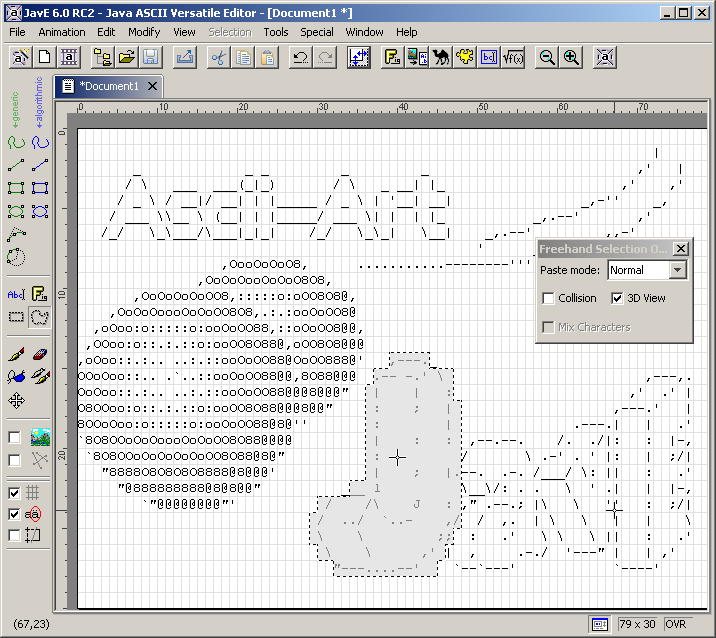 JavE is a free Ascii Editor. Rather than for editing texts, it is intended for drawing simple diagrams by using Ascii characters. It is like a graphics editor for editing texts instead of images. ,' -> create Ascii art                  `. JavE is written in 100% pure Java and so should run on almost every operating system. It is a standalone application and not available as applet. And many many more - check it out! Don't forget to visit other software projects of mine.